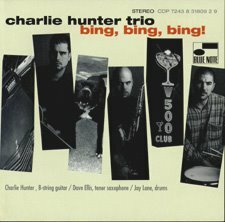 Although Blue Note records are my favorites, some will be surprised thatI enjoyed the Charlie Hunter "Bing Bing Bing" CD. My favorite Blue Notes normally were released in the 1950s and - 60s, but this one was recorded in the mid 1990s, when Blue Note had made a restart. Charlie Hunter, however, is a very giften guitar player, performing the 8-string guitar. This type of guitar gives a kind of hammond like sound, so typically for the 1960s Blue Note records. The style of the CD is funky, but always swinging with a heavy bass played by Charlie Hunter on his extra strings. I like it ! Enjoy it.